Christine and Long Vu have, for many years, directed projects that benefit needy people in Viet Nam. 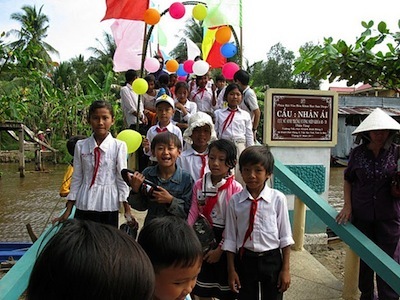 They work with citizens, businesses and organizations to fund the building of permanent bridges and drill fresh water wells in the Ca Mau region. They also raise money to fund individual scholarships for students attending university in Saigon. Since 2011 they worked to send over $60,000 annually to Foodaid Compassion and Vietnamese Culture and Science Association, San Diego Chapter. The U Minh jungle region of Ca Mau is made of many rivers, streams and canals. During the monsoon season many temporary and unstable "monkey bridges" which connect remote villages are destroyed. 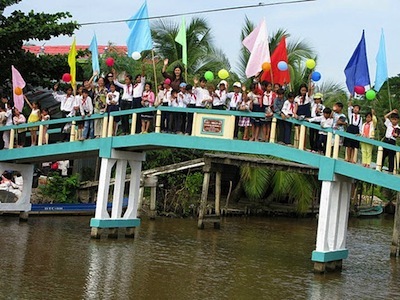 During 2010 the Vus helped direct funding to build 10 permanent and safe bridges. 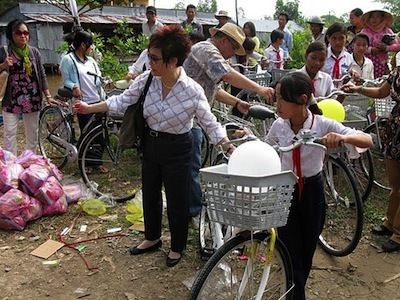 School children were given bicycles on which to travel to school.